Well, city kids, the first elimination for “So You Think You Can Dance” has come and gone, and after the fun, full night of dancing, we’re surprised and saddened by the outcome. 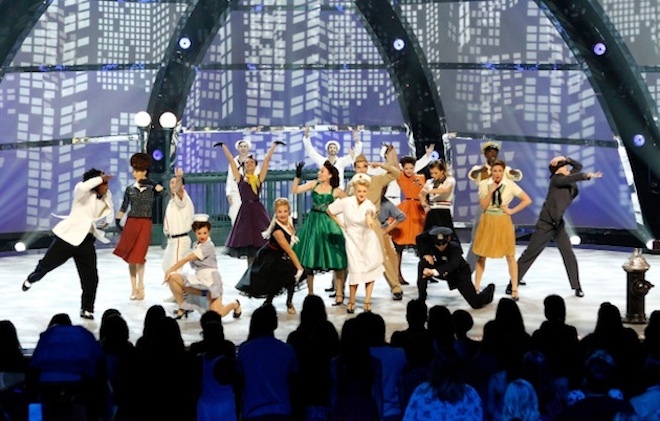 Cat Deeley, clad in a leopard print dress, introduces the show, and the Top 20 crew dances a wonderfully classic Broadway routine to “New York, New York” from On The Town, choreographed by Joshua Bergasse, who is also choreographing the upcoming Broadway revival. Emilio, Stanley, and Casey all stand out. After introducing the baseball jersey-wearing judges, Nigel Lythgoe, Mary Murphy, and returning guest judge Misty Copeland, who are all shilling for the upcoming baseball world series broadcast, Cat informs us that Brooklyn, Jourdan, and Malene are the three women in danger, and Casey, Nick, and Serge the three men. None of them dance for their lives, but they do have couples routines to do, with brand new partners. Sonya Tayeh represents the women choreographers tonight, being the only one on the panel (except for Leonardo’s partner, Miriam). She does two numbers, a jazz piece with Tanisha and Rudy and a contemporary number with Carly and Serge. Both show off her style, with high leg extensions, big lifts, and angular poses (sometimes all together), even though the contemporary music is more melodic and fluid. It’s also difficult when the choreographer says she expects the contemporary piece to be profoundly moving. Fortunately for her, it is moving, but that’s setting the bar high. Both pairs dance brilliantly, but Tanisha really stands out. Valerie hits the jackpot with her new partner, golden boy Ricky, and they dance a Travis Wall contemporary piece. (It’s not surprising Ricky’s so good since he studied with Alvin Ailey dancer Desmond Richardson.) Valerie works hard to keep up, as the choreography dictates, with her trying to hold onto him and him squirming out of her grasp. She does well and looks like she’ll learn a lot from him this season. Bridget, clad in black pleather, dances a Luther Brown hip-hop number—a take on the overdone “Hot Librarian” rom-com trope—with new partner Emilio, who’s wearing those dopey skirt/pants that somehow seem to be in fashion. Nigel says they make Emilio look short, like a Hobbit, but Mary says he gobbled up dinner (or elevenses, perhaps?) and “spit out fabulousness.” They’re also impressed by Bridget, though we think she could have more thrust. Jessica pairs up with Nick for one of the two ballroom dances, a Benji Schwimmer West Coast Swing. Given Schwimmer’s reputation and one of our favorite and not frequently performed dances, we’re hoping for a lot, so this is a disappointment. It’s all tricks without much dancing and the music is too fast. As Mary says, the best part is the chassés across the floor, because they’re the only element that really fits with the music. The other ballroom routine, a Miriam and Leonardo Argentine tango, is much more satisfying. The judges are impressed with Brooklyn and Casey’s maturity, though we want to see a little more confidence from Brooklyn. Dave Scott returns to choreograph Emily and Teddy in a hip-hop routine. Teddy, who’s so much fun to watch, shines doing his own style, but Emily keeps up with him fairly well. It’s confusing why she’s dressed like Rosie the Riveter (or maybe Lucille Ball) for this hard-hitting hip-hop routine, but she performs well though she could be a little more grounded. Poor Stanley makes a faux pas while introducing his new partner when he mispronounces her name as May-leen. They dance a complicated, 1960s-inspired Spencer Liff Broadway routine, using telephones with extremely long, stretchy cords. The judges are all sour on it; they want more connection between the couple and feel the concept is too limiting—understandably, since the dancers are literally tethered. Despite agreeing, we also think Stanley is dazzling with his sky-high jumps. It’s unfair that the judges criticize the dancers for the choreography’s shortcomings. The final two routines are from Sean Cheesman, with Jourdan and Marcquet dancing jazz and Jacque and Zack dancing African jazz; all four expertly handle being out of their comfort zones. In the former, Jourdan interrogates Marcquet while wearing thigh-highs and garters and an army general top, like some tacky Halloween costume. If you can forget the ridiculous outfit, the routine is enjoyable, especially the side by side dancing and fighting over the table, which brings back the waning concept—and allows Marcquet to steal the spotlight again. Meanwhile, Zack and Jacque take a page from The Wiz and emerge as “warriors of ancient art” from a colorful backdrop. Jacque holds her own, but Zack is thrilling. With the couples’ routines complete, the judges deliberate over which dancer will go home while the first of the winning crews, Chloe Arnold’s Syncopated Ladies, dance an awesome tap routine. Despite the obvious dubbing of their taps, the choreography is dynamic and pairs the music well with cool moves, like the single pullback to a toe stand, and wings that start with Chloe in the middle and build up, emanating out toward the ends. The bad news is not that two dancers are going home. We thought for sure it would be Brooklyn, but the first shock comes when Nigel excuses Malene from the competition, essentially saying she’s been skating by on her beauty. Even more shocking is the men. We weren’t sure who it would be but felt pretty sure that it wouldn’t be Nick, yet it was. The poor boy is just trying to hold himself together, and his best friend Rudy can’t do it at all. Very sad. So City Kids, what do you think? Do Nigel and the judges make the right call? Are you happy with the results? Which is your favorite routine?